Electric guitars may be the most prominent instrument in today's music scene, but an electric guitar is useless without a guitar amplifier. Guitar amplifiers, often called amps, are used with electric guitars in order to amplify their sound. The amplifier connects to the guitar via an audio cable. 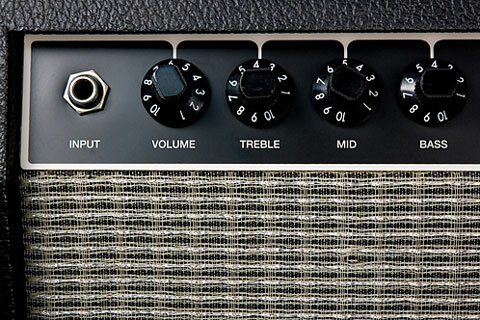 A guitar amp has volume, bass, and treble controls for adjusting the sound it amplifies. Most guitar amps include built-in speakers and some offer a reverb sound effect feature. How exactly does an electric guitar amplifier work? It takes the guitar's signal and makes it audible by boosting it enough to drive a speaker. A typical amp is made up of three parts. The pre-amp boosts the guitar's signal, so the power amplifier can pick it up and boost its strength further. Finally, the speaker relays the sound. Since many electric guitar players actually want distortion, amplifiers are designed so that guitarists can control the level of distortion. Musicians can also play with feedback loops, which impact the vibration of the guitar strings, and sound effects, which electronically modify the audio characteristics. These, in turn, affect the overall sound. When buying a guitar amplifier, consider its intended use. A 10 to 20 watt amplifier should suffice for home or studio use, while 50 to 100 watt amplifiers are commonly used on stage. Consider also the differences between tube and solid-state amps. Many advanced guitarists prefer the warmer, fuller sound produced by a tube amplifier, but solid-state amplifiers are often less costly and more reliable. On GuitarAmplifiers.us, you can learn about the different types of guitar amps, including models designed for bass guitars and even for acoustic guitars with specially designed pickups. You can also browse guitar amp manufacturers and retailers where you can compare prices and specifications on a wide range of guitar amplifiers and accessories. This guitar shop offers electric guitar amps, acoustic guitar amps, and bass amps. Find brands like Crate, Fender, Line 6, Marshall, and Vox at their online store. This guitar maker offers guitar amps, parts, and accessories in their online storefront. 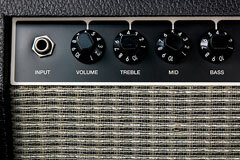 Database of guitar amp professional reviews.